I admit it. I am vain. It’s just one of a long list of personal flaws. The list is slightly shorter than it used to be years ago, but, it’s still awfully long—but enough of my personal failures. On to my sucesses! Today, I received my copy of the 2007 Pattern a Day Knitting Calendar. I have 3 patterns in the 2007 calendar. I didn't know for sure if my pattern would be in the calendar--the editor didn't do that good a job confirming things--but it's petty to complain since they were included. 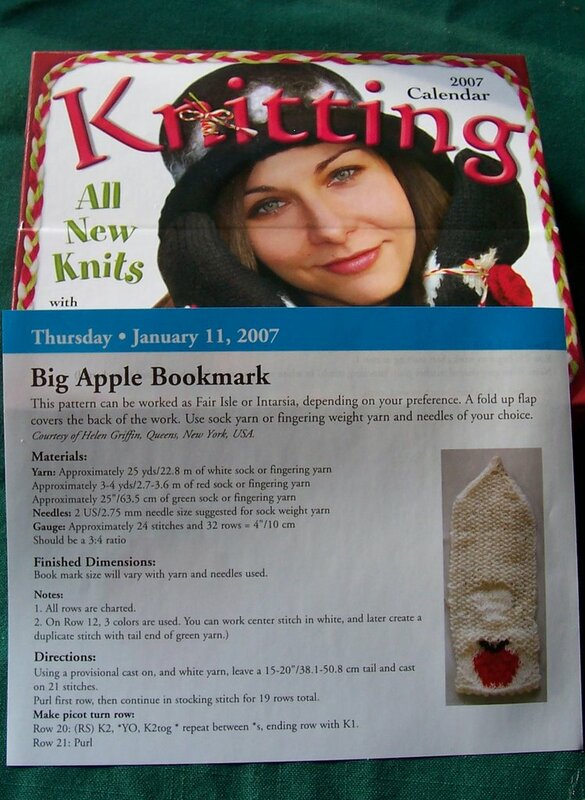 Last year at the 2005 NYC Knit Out, our guild planned to hand out book marks. Ideas were solicited. My ideas were rejected (and truth be told, knitting them in quantity would have been a substantial effort.) Still the ideas and patterns got printed up in the Guild Newsletter, City Purls. Copies of back issues of CityPurls are available in PDF format on the BAKG web page, under member’s benefits. Paulette Lane saw them there, and solicited them for the 2007 Page a Day calendar, and now they are in print. January 11, March 8 and August 13 are my days. But knitting patterns are different. They are part of my creative side. Reporting facts, (no matter how well it’s done) is, well, pretty straight forward, and done right, factual. Designing is creative --and pattern writing is a much more technical skill. I’ve added some links in the left hand column, including one to my on line photo gallery. You can see images of the 3 bookmarks there, in the knitting album--if you don't want to wait or don't plan to purchase the calendar. Or just jump to an image of all three. Those are 3 mini apple bookmarkers in the center, braided loosely for effect. Personally, I like the mini apple on the eye cord best--thought I think the medallion works the best. It’s pretty funny. I almost never use bookmarks, I find it easier to just note the page I am on when I finish reading, and remember it. I forget lots of things, (been known to forget my purse!) but I love reading and I never forget what page I am on. Actually is worse than that—if I read something really interesting, I will look at the page number, and remember it—sometimes for years. (And still forget to buy milk when I am in the grocery store) Even when I forget the page, I will remember if the information is on the right hand side or left hand side page, and will often remember the paragraph. I used to be very good at this when I was a child (and into my teen and early adulthood) but I’m no where near as smart or have as good a memory now as I did then. And from now on, I will remember January 11th, March 8th and August 13th! Computers! If it’s not one thing, it’s another. My ‘high speed’ line is dependant on a modem provided by the cable company. My first modem (backing 1992) lasted 5 years. These new high-speed modems last 5 moths or so. Then you get into the “if there are problems, try ‘cycling the modem off, disconnecting it, waiting 10 minutes, turn your computer off, reconnect the modem and then restart your computer. Not to mention, its cunning ability to drop your connection moments before you hit the save button, --and everything worked on is lost! That's happened more than once in the past 10 days. So now I have to schedule time to wait for the cable guy and get yet another modem. My printer is giving me grief too, though, it’s partly my fault. I got one of those do it yourself refill kits for the ink cartridges. It worked fine the first time I refilled the cartridge. But the color cartridge was a bit pickier. I overfilled it I guess, and it leaked. The water soluble ink then leaked into the little circuits on the cartridge and print head, and nothing worked. Now, the color is uneven --no, (or at least not much) red. All this happened as I printing up material for the NYC Knit out—that is for the BAKG booth) at the knit out. The A in the logo is a big red apple. Thank goodness for red sharpies. After the knit out, I was too tired to knit! Tuesday at my S&B group, (Yahoo group LICKNit2), all I did was ball up yarn. Somehow have gotten along all these years with out a ball winder or swift—fortunately, I was able to borrowed Dana’s ball winder, and 9 huge balls of yarn latter, I have some cotton I can use. (This stuff is fine boucle cotton. 3 strands held together = worsted weight. I haven’t decided yet if I will use it as 2 stranded DK or 3 stranded worsted. No photo’s, since nothing is finished. And the bonus socks for the month are planned as presents. I could take some photos of my newest additions to my stash. The Black cotton (coned) was the largest of 5 cones I balled up. The other four cones I did by hand. 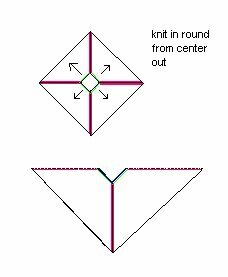 5 The Knit-in-the-Round Square Poncho. This poncho is also started at the neck edge, but there are 4 points, and there are increases either side of each point, (8 increases every other round) and laid flat, it resembles a square. But unless it is worked in garter will not quite lay flat--still Square is the best name for the shape. The neck opening is square too (Vnecked in front and back) --though both this poncho and ponchos 4 and 6 can be started with 8 to 12 inches of ribbing to make a turtle neck –something I never do! Basicly the same as the square poncho, with all the same advantages and disadvantages. The major difference is, the 8 increases every other row are spaced further apart, and NOT LINED UP. The round poncho looks best when knit short (elbow length) and its especially suitable for lace. It can be knit flat, (cape like) with a center front opening, or knit in the round. When worked in a pattern like feather and fan, the increases can occur, not regular as rain 8 every other row, but with 16 increase every 4 row, or 32 stiches increased every 8th row. The naturally curvy edge of a feather and fan pattern is quite becomming at bothe edges too. Beginning with 8 repeats of a 8 stitch pattern can be increased to a 10 stitch pattern after row . This would create 16 increase in 1 round. The pattern could be increased again, (to a 12 stitch pattern) after another 4 rows… and so on. Feather and Fan is one pattern that works will with this kind of increase. You can even use Elizabeth Zimmerman’s Pi shawl formula, if you remember you are really starting your shawl at round 12 (and need to knit 4 rounds to be at a magic number (16) and double your stitches then, (and again at rounds 32, 64, 128, etc) –and fill the rounds in between the increase with small patterns, in lace or just using fancy stitches. A variation on this basic design is the arc, or incomplete circle. Acr's are closer fitting. The stitch gauge and the number of increases in each round are the decisive factores in making a circle or arc shape. 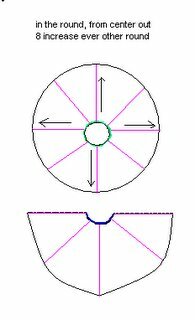 Both cthe circle and the arc also work well as capelets. Started with just 3 stitches, with increases every row, the poncho starts out as a large (very large!) triangle. 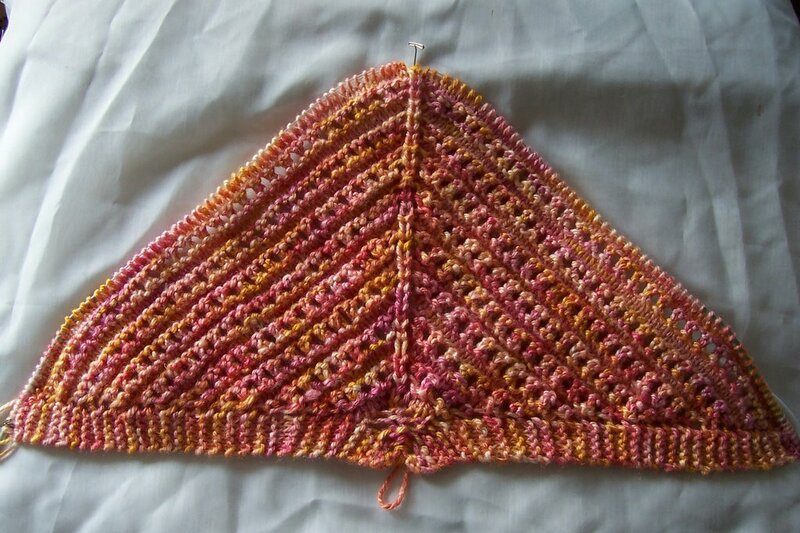 It works best when the triangle is symmetrical, so garter, or even sead stitch are good choices. 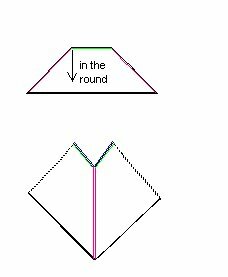 The bound off edge is folded to make a smaller square shape, and then sewn together to make a center front seam, leaving the edge closest to the fold open a neck opening. 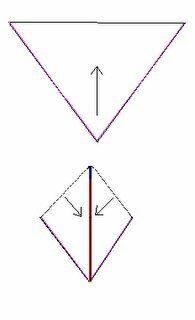 Because of the fold, the direction of the knitting in back is straight, but it's diagonal in front. Best suited for advanced knitting techniques. 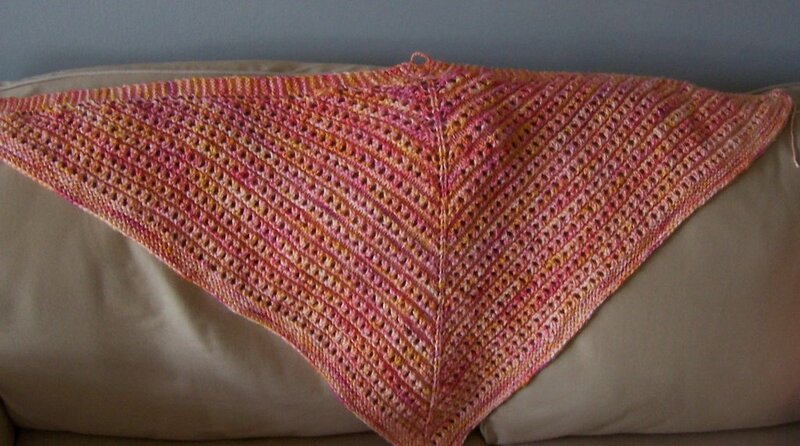 This shape is more often seen in crocheted poncho’s, especially those made from ‘granny square’ motifs. It is made from 2 idential notched square are sewn together. It could be started at several points, but I think this style would look wonderful in entralac. One of the side seams could be replaced with a provisional cast on, the second side seam could be eliminated by grafting. Plain or fancy, single color or multi color (or Noro self patterning colors) knit entralac square could be substituted for the normal granny squares. There are, no doubt, other styles/techniques for knitting poncho’s -- but thesse 8 styles are by far the most common. And each of these styles have many variations, and are open to improvements: the Rhombuis poncho often has an extra line of increases at the shoulder line.—the Folded triangle benefits from this as well. Changes as minor as a fringed or not fringed change the final appearence of a Poncho dramaticically. Solid colors or striped with a self striping yarn, or striped with a variety of yarns area other way to change the final result. 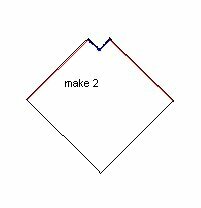 Poncho's might seem loject to start desgning with--but a simplely shaped geometric froms they offer a beginner opportunity to think about how to make shapes to fit the human form. By Thursday (September 13) I was back to work--in other offices, doing my small part to make things better. Monday September 23rd, I was back down town. TheWorld Trade Center was still burning, and would continue to burn for months. At first there were full fires, but til late December, things smoldered. Every day, the air was filled with awful smoldering smoke and and dust. I wrote the poem during those long dark months. Love’m or hate’m, they are a perennial favorite. Many knitters don’t seem to realize, there are a limited number of templates that are used to ‘design’ poncho’s. Learn the templates or basic shapes for poncho’s –all are easy to learn—and you are half way to designing your own. Learning to design something as simple as a poncho is a good way to start learning to design. 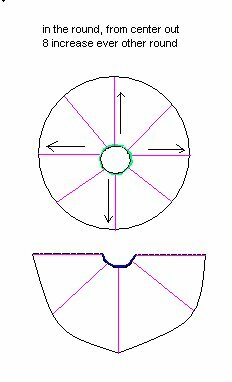 There are 20 to 30 ways to shape a an armseye and sleeve cap. With poncho's, it is simpler to understand the basic shapes and how those shapes work. Most are of the templates are easy..the final design, is the result of pairing a basic template with specific yarns, and stitch patterns, at a specific gauge. Every template/style has advantages and disadvantages—and defining what is an advantage is what is a disadvantage is mostly personal opinion. I like symmetry in clothes. I personally think that asymmetrical clothes are unbecoming on everyone, but stunningly tall, thin and naturally very symmetrical bodies (ie, super models) can still look good in them. Normal people, (ie not exceptionally tall, or exceptionally thin, or exceptionally symmetrical) people look less than their best in asymmetrical clothes. Anyone who is short, or fat (or just not thin!) or is slightly out of balance just looks terrible. I have other opinions about clothes, but most of them are not big factors in poncho’s. 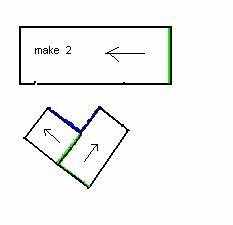 So what are the basic shapes, and what are the advantage/disadvantages to them? I have created some drawing to help explain them. 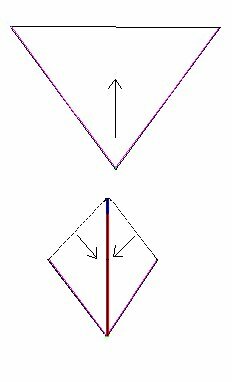 Large Arrow=common directions of knitting. In many castes, there is more than one way to knit the basic shape. And in every case, there are many options available to the knitter/designer to customize the shape. 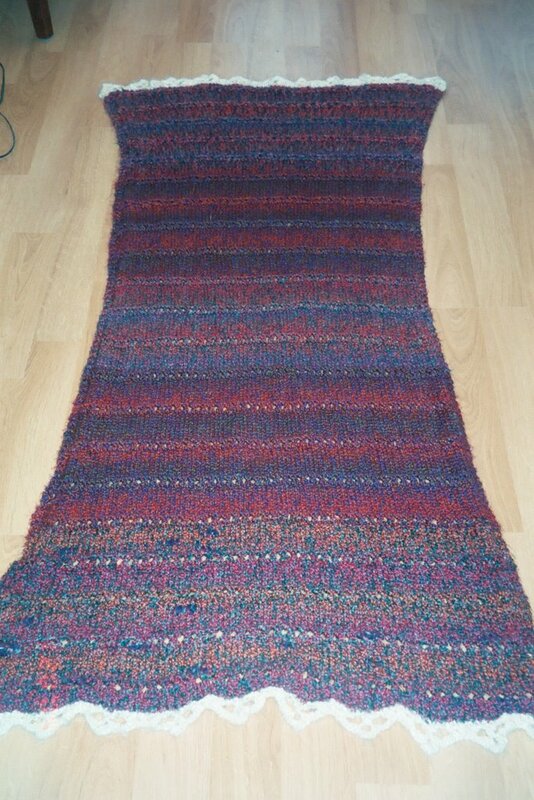 This poncho is knit, starting at narrow edge as a large rectangle. It is ‘finished’ by folding it in half, and sewing 1 side seam, leaving a 10 or so inch gap at folded edge, which creates a neck opening. Normal worn with the fold line at one center shoulder, and the seam line at other center shoulder. It can also be worn with seam as center front, (which makes a shawl-like back, and a v neck front, or with seam line in back (and back v neck) and a boat neck in front. No matter how you wear it, its not symmetrical! When its worn with one side having a seamed center shoulder edge, and the other arm having a folded edge, its totally skewed. And it gets more skewed with every wearing. The seamed 2 rectangle poncho is another popular pattern. It is less asymmetrical than ponch 1, but I still don’t like it. It's often shown with a striped element, (either real stripes (horizontal) or cables or other Vertical stripes. And right there at the seams, (2 since this poncho as mirror symmetry and the back is the mirror image of front) the “stripes” are at right angles. This creates a strong diagonal line across the body—its not too bad on children, or any one thin, but its not the best choice for adults. Secondly, since the knitting drapes and folds differently, (and stretches differenty over time) it becomes more asymmetrical over time. It also tends to twist while being worn--the seams end up a the center shoulder line, and the poncho ends up hanging even more asymmetirally. This is a great poncho. It's easy, and it's symmetrical. The side seams can be left open, sewn all or part way shut. Depending on how you knit it, and which neck opening you chose, it can be more or less difficult to knit and to wear. It can be knit in 2 long rectangles, with a center back seam and center front open as well. One of my favorite poncho styles. 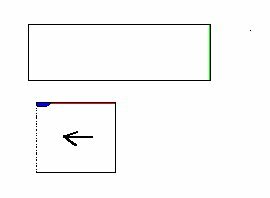 Because there are increases every other row, the pleasant rounds at the or near the cast on edge soon grow to be endlessly long by the lower edge. And unless you knit it long enough to have the center front and back touch the ground, the poncho will only cover upper arms, not the lower arm. 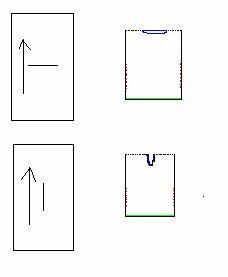 Four more basic templates for poncho's, and some images of poncho's that use the basic templates shapes. God knows I am not a yarn snob. I have intermittable skeins of Red Heart acrylic. No matter how fast I knit it up into blocks for Warm Up America, or into hats for charity knitting, or even into ponchos for my granddaughter, there is always more--usually given to me, partly i suppose, because I am known to be a knitter. You know how it is. Some one dies, or moves, or has arthritis too painful to knit, and rather than throw the stuff out, they look to find someone or organization to donate it to. I pass a lot of the Red Heart on. Still like proverbial rabbits, it seems that skeins of Red Heart multiply faster than I (or anyone!) can knit them up! There is difference Knitting with Red Heart isn't as enjoyable as knitting with a fine silk or wool, or other natural fiber. When I was knitting my GD poncho, and each row got longer and longer, I dreaded each stitch (and put the whole thing aside for a few weeks). Red Heart has it uses, but it doesn't really feel good as you knit it. This week, I have been knitting with silk, and I had trouble putting the knitting down! I won’t say I knit this in record time, but even I am surprised at how fast I worked—of course it was difficult putting down the knitting to sleep. The yarn, and fabric felt so good. There was less than optimal yardage, (a scant 375 yards) so its really a shawlette. With a pattern that started with 7 stitches cast on, (a fast row!) and ended with 251—which took a bit more time! This Morning, before I breakfasted, finished the last few row of garter on the bottom edge and I bound off. It’s not yet blocked or finished, and roughly measures 42 inches (apx. 1.1 meters) across the top, and 23 inches deep. This silhouetted view obscured the colors, but does show the simple lace to advantage. I ended with enough yarn to work 2 more rows –but its hard to estimate how much yarn is needed for 10 rows of garter (and with 4 increases ever other row, it’s even trickier!) and for a bind off. A shawl, or any garment can be ruined by a tight bind off. Better to have a few yards left over than not enough. I am thinking about a tassel for the center back. Maybe even one at each end. Septembers socks.. the heels look a bit weird, but they fit fine. 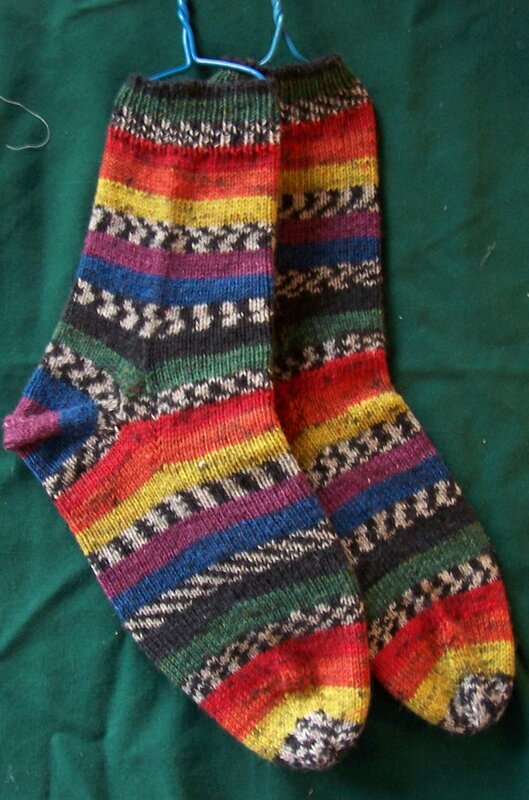 These socks were done toe up, with a banded toe, and band afterthought heel, in OnLine Seierra Effects, on size 1 needles, (circa 9.2 stitches to the inch). She gave me (re-gifted) some 700 yards of hand spun tusshah silk. The stuff is gorgeous! It's not really Jills' colors, and even though she loves silk, she seemed happy to part with it. All day Saturday, I fondled it, until finally Saturday night I balled it up, and started to knit. I had a scant dozen or so more rows waiting to complete Septembers sock, but the 700 or so yard of hand spun tussah silk was driven me insane. I just couldn't not knit with it immediately! I am not sure what I like best, the color or the hand! The golds, pinks, and raspberry are so warm, and such friendly colors against the skin. The tussah silk is dry, and crisp, yet soft. By Sunday morning, I had 12 inches or so of knitting done--the start of a top down shawl. are only 4 'Pattern' rows. Only one row of purl stitches too, for those of you who don't like to purl-- though, personally I don't mind purling. One of the best things about it is, you really don't have to swatch. Gauge is not critical--It is even a factor--looser, it makes for a more open lacy shawl, tighter, less lacy shawl. It's really a matter of what kind of finished effect you want. This basic shawl can be worked with any yarn, in any gauge. Use needles appropriate to the yarn to have firm, but still drapey fabric. with the center back stitch always knit. Rows 13, 14, 15 are a lace pattern called beading. Beading consist of : a purl ridge row on right side, then a row of Yo, K2tog,"lace", followed by another row of purl ridge on right side. In this pattern, there are increases (4) worked on every right side row, included the beading. The center back stitch is worked as knit stitch on right side. You can add more rows of stocking knit stitch between the rows of beading if desired. The Red K1 and P1 in the pattern are 'place markers' to help read the pattern, they are the center stitch in each row. 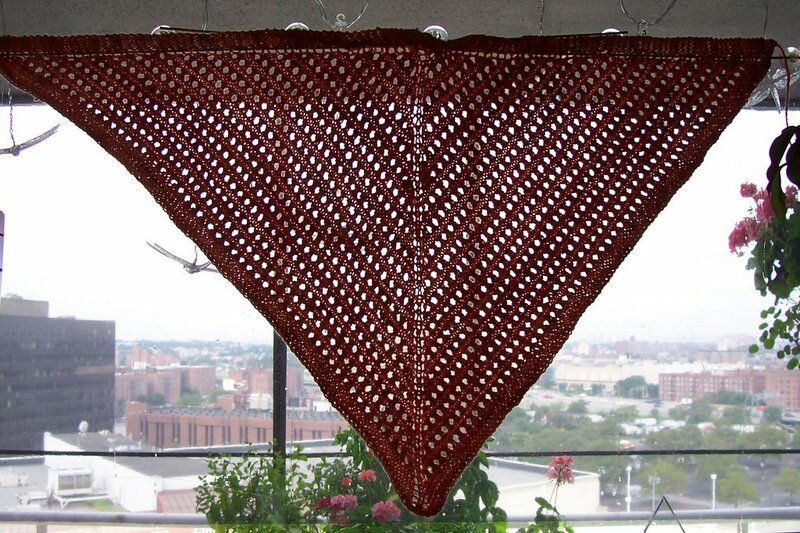 Here is a rectangular shawl, that also uses "beading" lace pattern. 5 skeins, in 2 different colorways, the finished shawl is about 45 by 60 inches. The actual pattern for these shawl is slightly more complicated--the lace edge is 'cast on' design, and was grafted on to the second edge. The lace edging (my own design) requires that you cast on 18 stitches for every 10 needed (8 stitches are 'lost' in the pattern). But other edgeing, would work as well. I woke up yesterday morning, and before breakfast, finished (including weaving in!) September's socks. No photo's yet, though. Since then, I've gotten another 3 inches of the shawl completed- and started yet another pair of socks! Holidays are coming, and I have things to knit. It’s another grey day today. It’s been a week of rain, or so it seems. Not all day rain, but grey skys, and intermittent rain. It’s the weather, and as they say, if you don’t like it, wait a minute, (or a day or two) and it will change. I am waiting. Today’s rain is the last remnants of hurricane/tropical storm Ernesto. It wouldn’t be so bad if felt tropical, but its chilly, 62° or so. Not cold--but cool and damp. 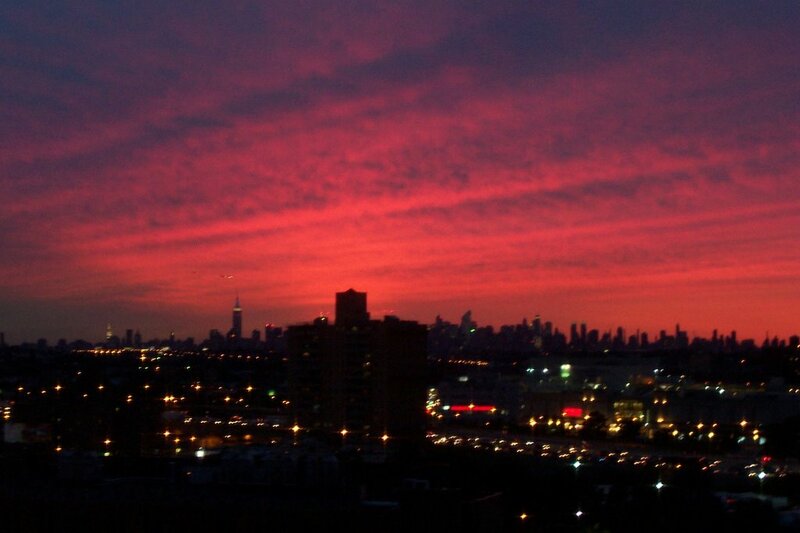 I was trying to remember that last sunny day, and remembered instead, the great sun set we had on Thursday. 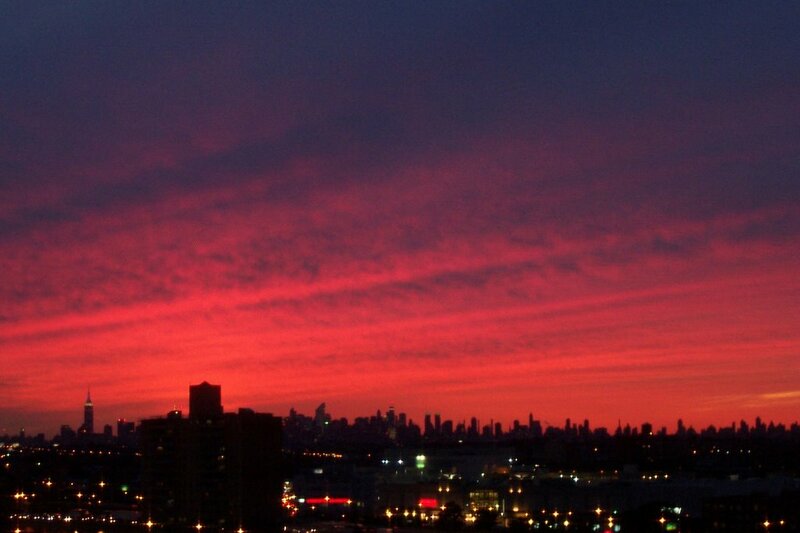 I’ve lived in NYC all my life. And for a good percentage, I’ve lived high up. As a child (and 9 or so) till 17, in my parents apartment, on the top floor (5th) almost on top of a hill—and not just any hill, but the end of the Kingsbridge Crescent. The crescent is a geological formation, and the second highest point in NYC (the highest being Todd Hill on Staten Island). The apartment was a wonderful place. The living room had a huge window with a with western view (and an almost equal as good eastern view, but this was in my parents bedroom). The south facing windows got lots of light, and breezes, but they only afforded a view into the neighbor’s windows! 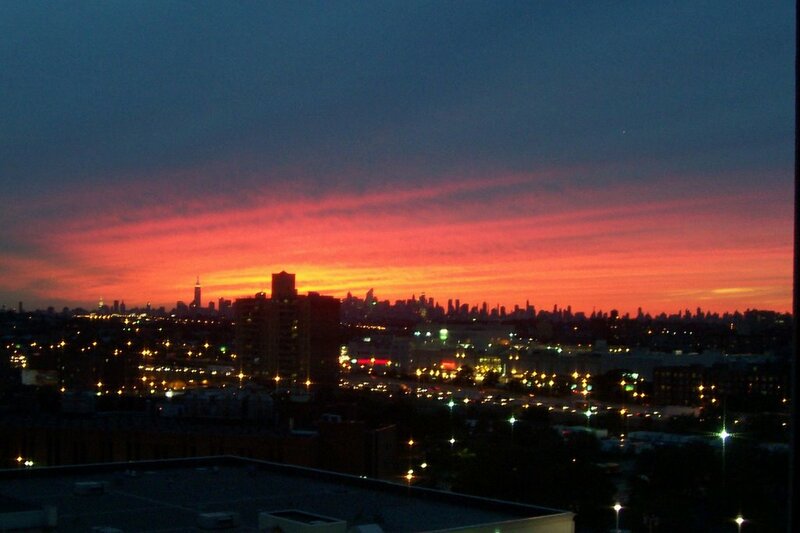 When I was first married, I lived in another 5th floor walk up apartment with a western view. 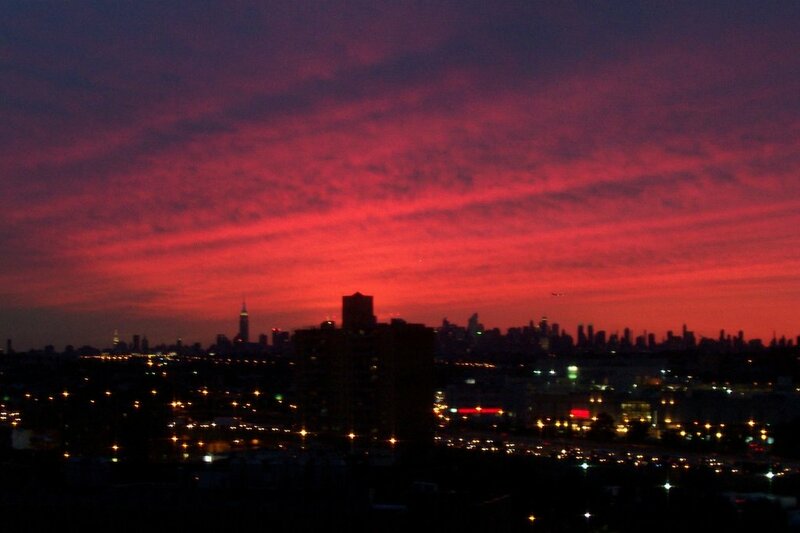 The windows weren’t as big, but the view was less obstructed. Our first house was in a low land (a former swamp actually!) 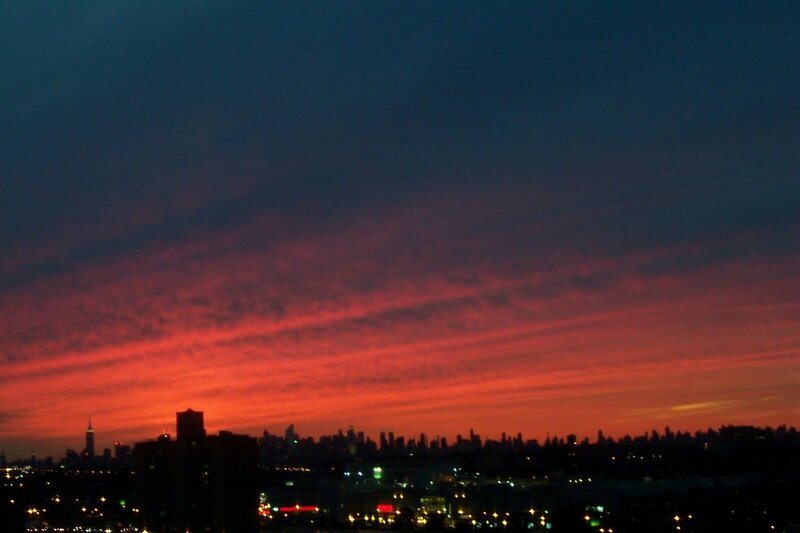 but the second house, was on top of hill, and from my deck, I could see (well in the winter, when the trees were bare) a good percentage of the NYC skyline when looking west. 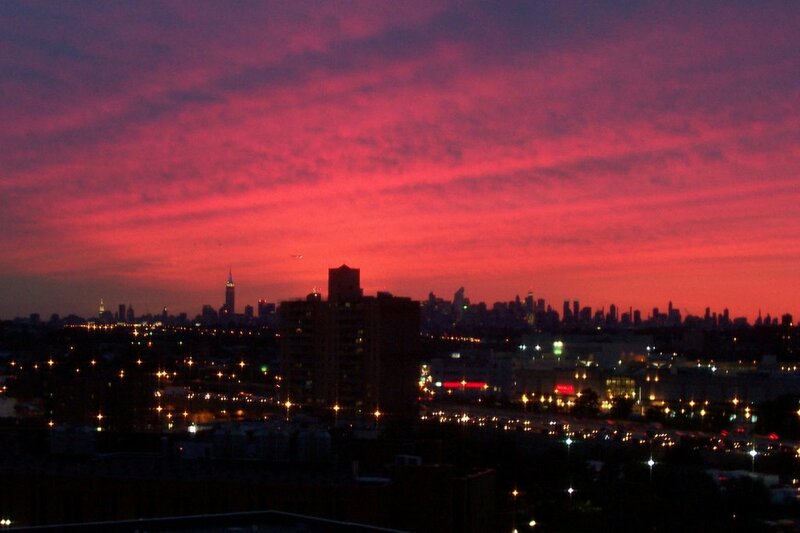 Currently, I live in a high up (14th floor) apartment that has a spectacular western view. It is a great delight. 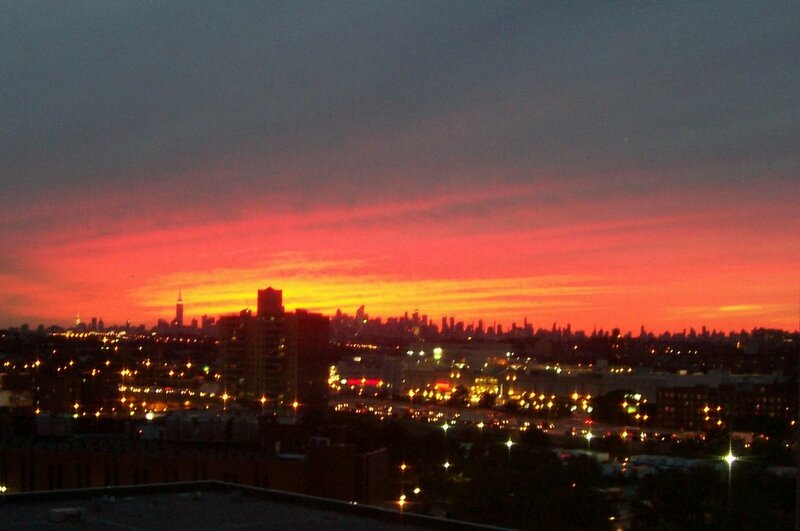 A view was one of my priorities when I was house (apartment) hunting. But Wednesday, at the Citicorp Knitting Meet, Barbara (aka knitnerd) ooh’d, and aah’d over my sneakers. I bought them just a few weeks ago, (remained, end of season sale at target’s-$3.25!) and in a fit of insanity, decided to gussy them up. There is no fun like the fun of making French knots, and bullion stitch roses on the toe of shoe (with your hand stuck in, to reach the needle.) I didn't plan or design really, I just started to embroider. Not perfectly successful, but fun!